African cattle breeds are numerous and diverse, and typically well adapted to the harsh environment conditions under which they perform. They have been used over centuries to provide livelihoods and food and nutritional security to their keepers. 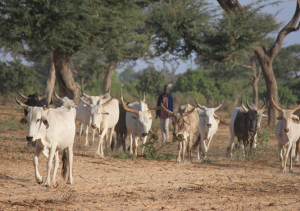 However a number of African cattle production systems are changing, including via intensification where livestock keepers are able to provide a higher levels of inputs (for example, in relation to animal feed and health-care). These livestock keepers are thus seeking cattle breeds that are both adapted to the local environmental conditions and productive. Such livestock can be made available through appropriate genetic improvement strategies. The most appropriate genetic improvement strategy for any developing country livestock system will vary depending on the specific context, with options including breed-substitution, cross-breeding, within-breed improvement, or a combination of these. Supporting such strategies at national or regional levels is a major undertaking, requiring amongst others appropriate policy, institutional arrangements, underlying data collection, analysis and feedback platforms, attention to incentives for livestock keeper engagement, and involvement of a range of partners including the national research system and private sector. Attention to these is critical for the genetic improvement strategy to be sustainable and provide impact at scale. Further strategic thinking on which specific applications of genomics, to the varied cattle systems in Africa, are most likely to lead to positive impact – on the livelihoods of the rural poor, food and nutritional security, or environmental sustainability – is required. This will require significant stakeholder input to find the intersection between what is technically feasible and what is relevant, and a priority, to the low-input cattle systems in Africa.